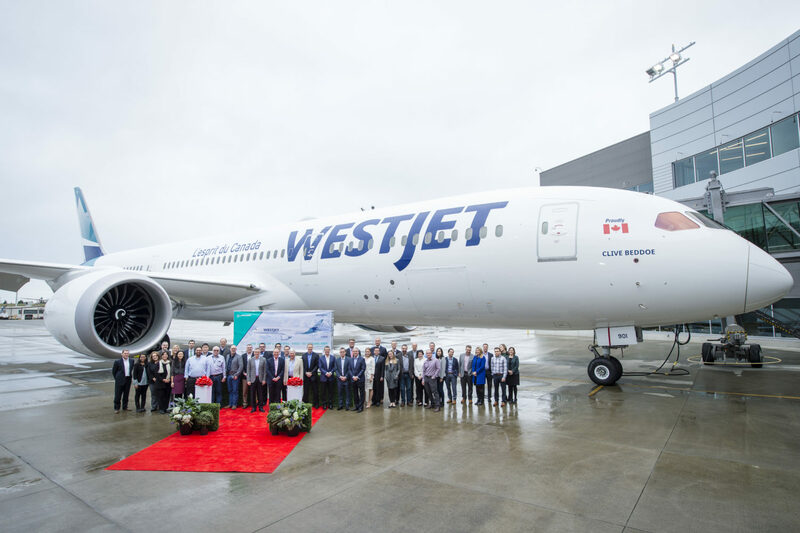 WestJet is now poised to go toe-to-toe with Air Canada on international routes after it took delivery of its first Boeing 787-9 in Everett, Washington last week. The $283 million plane, named Clive Beddoe, after the airline’s founder, took the short hop from Paine Field to Calgary where it will be used for crew familiarization and training for the next month. After that it will be used on the Calgary-Toronto routes and after a shakedown period will start overseas service with flight from Calgary to Gatwick on April 28. WestJet has ordered 10 Dreamliners and in addition to replacing the leased fleet of Boeing 767s on flights to Europe, the airline is eying routes to Asia and South America. The aircraft seats 320 people and has a first class section with lie-flat premium seat pods. There is also a premium economy section and regular economy. Air Canada has been flying 787s for about five years and uses them mainly on international routes.